I am 46 years old and of Dominican origin. I was born in St. Francisco of Macoris, a province in the north of the Dominican Republic. I immigrated to the United States in 2007 seeking to achieve some goals and dreams. But the Lord had other plans for me. Since childhood, I have always wanted to be a priest, and I was especially encouraged by my dear aunt, Sister Flora Rodriguez, who is like a mother to me. Something that always really struck me was the celebration of the Holy Mass. My mother told me that when I was 2 or 3 years old, I liked to go up to the altar when they were celebrating Holy Mass in our neighborhood parish. Apparently, our Lord Jesus Christ was calling me. Then when I was a teenager, I was an altar server and sang in the choir of children and teenagers of my home parish in Santo Domingo, Dominican Republic. As time passed, I continued to feel a call to the priesthood. My pastor, religious sisters, seminarians, catechists, and parish leaders all encouraged me to go to the seminary because they said I had a vocation to the priesthood, but before making the decision to go to the seminary or go to university, I decided to attend university to study graphic design. After graduating from university, I worked as an art teacher in a Catholic school and as a graphic designer for a TV channel in the Dominican Republic. Nevertheless, I continued to serve in my parish community in Santo Domingo as a reader, cantor, catechist, parish and diocesan leader, and the desire to be a priest always remained present. Time went by, and I had to immigrate to the United States in 2007. In 2010, the restlessness and desire to be a priest to serve the people of God in the Diocese of Allentown resurfaced. What motivated me to discern my priestly vocation and go to seminary was the great need of the Hispanic Catholic community, especially in our Diocese of Allentown where there are few priests of Hispanic origin. Although we have very good and holy priests who serve the Hispanic community, I felt in my heart that I could offer something more to my community. I have always had a spirit of service and dedication, something I learned from other priests and religious from my youth until today. But on this discernment journey, I also learned that I can not only serve the Hispanic community in our Diocese of Allentown, but all Catholics without distinction of nationality and language, and I have been called to serve God's holy people to meet our Lord and Savior through the sacraments and community life. I am the second of the three children of my parents Juana Rodríguez and Eduardo Rodriguez. My siblings are Rosa and Martin Rodriguez; Martin is the oldest, Rosa is the youngest and I am in the middle. I have always considered myself a person blessed by God because I always have people accompanying me in my personal, spiritual and vocational life, especially my parents and my siblings who are very important to me. I place a very high value on family; for me, family is first, although God gives us in our lives people who become part of our family. I have very good friends who have had a great influence in my discernment to the priestly vocation. Among them are Sister Flora Rodriguez (my aunt), Father Juan Carlos, Father Andy Gehringer, Father Michael Mullins, Monsignor Robert Biszek, Monsignor David James, Deacon Saul Hernandez, Aunt Edita Morales, Maria Espinal, Noel and Magaly Gonzalez, Bernarda Liriano, Aurora Tineo, Juliana Peralta, Alba Benitez, and many other brothers and sisters in the faith of my parish community of San Pablo in Allentown and San Antonio of the Dominican Republic. There are others, and although I do not mention their names, their faces are always present in my mind and heart. I like to exercise, although it may not seem like it, and another thing I like is graphic design, making Facebook cards with nice messages. I like to listen to good music, sing, cook, watch movies in the cinema or at home. I like to travel to know other places. My life as a seminarian can be said to be different from that of other seminarians at Mount St. Mary’s Seminary in Emmitsburg, Maryland. Learning the English language is especially a factor that has always been very present throughout this process of discernment, acceptance and formation. After my first two years of formation at Pope St. John XXIII National Seminary in Weston, Massachusetts, where I had a very nice experience and where I found wonderful people like my friends and brothers, Father Eric García and Father Alberto Gonzalez, I transferred to Mount St. Mary’s Seminary. They have an excellent English-as-a-second-language program. At the seminary, I have found wonderful people and friends like Caroline Purcell, Deborah Wentling and Lisa Carbone-Jenson, who have given me great support in my academic formation, spiritual life and personal life. They are like my mothers at the seminary. Seminary days begin very early, starting with personal and community prayer and Holy Mass in the morning. This is followed by theology classes, English classes, classes and more classes, meal times, Holy Hour, Evening Prayer, going to the gym, doing homework and more tasks, personal prayer, and taking time to talk to my parents and communicate with my brothers and friends in Allentown or the Dominican Republic. I do not have much time to participate in social activities at night in the seminary because I take more credits than others because of English classes. During the week we have a day of pastoral assignment, which is a very important aspect in our formation as future priests. On weekends, I do my laundry, clean my room, do all my homework assignments, fulfill my liturgical assignments, and participate in community prayer and Holy Mass, and exercise. Sometimes I go out to the movies or have dinner with my friends and seminarian brother Nico Quintos, who is from the Philippines, although this is not very common because I always have many assignments to do for my theology and English classes. At Mount St. Mary’s Seminary, I have found very good teachers and people who are helping me in this process of discernment and vocational formation, especially Monsignor Andrew Baker, Monsignor Anthony Frontiero, Monsignor Michael Heintz, and many other priests and people. In my life as a seminarian, I receive great support from my Diocese of Allentown, my Bishop Alfred Schlert, my new vocation director Father Christopher Butera, other priests and religious. Discernment to the priesthood is a long road with varying details of shapes, sizes and colors, but we do not walk it alone. Most especially, we have the company of the Lord Jesus Christ who is the one who calls us, and we have family, the Church, the Diocese, the Bishop, the seminary, the community, and brothers. 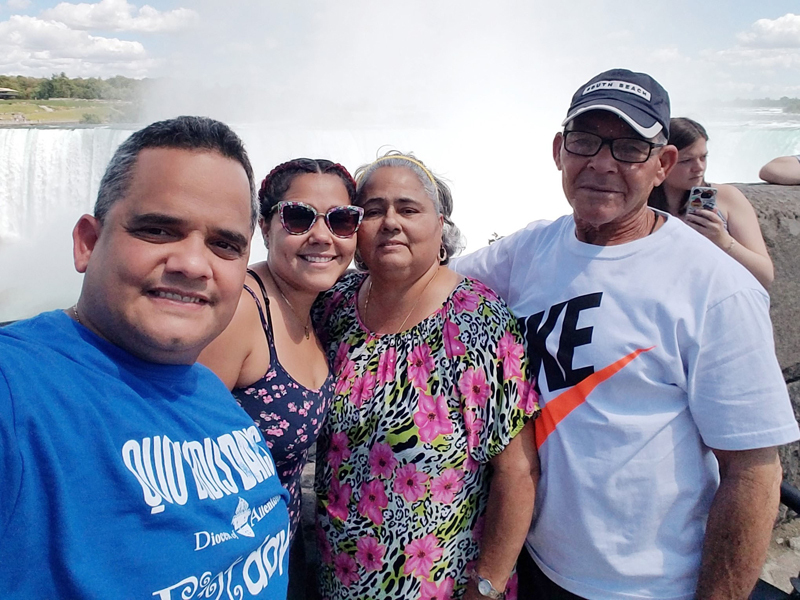 Juan Rodríguez, left, spends time with his family during a trip to Niagara Falls, Canada. From left are his sister Rosa Rodríguez, his mother Juana Rodriguez and his father Eduardo Rodriguez.